One of the best free views of Tokyo is just a few minutes from the Ebisu Station on the Yamanote Line. For best results, go between storms or just after a typhoon. My favorite place to view Tokyo is Ebisu Garden Place Tower. There are other free locations in Tokyo, but they are frequently crowded, you can’t get right next to the windows, or the glass is so old that the view is no longer very clear. Some of the restaurants on the top two floors of this building aren’t very expensive either. Driving schools in Japan are big business. Unlike the USA, where most drivers pay little or nothing to learn how to drive and get a drivers license, Japanese drivers typically pay $3,000 – $5,000 to go to driving school and obtain a license. That’s assuming they pass on their first attempt. It costs even more if they don’t pass and then go back to driving school, etc. So it should come as no surprise that the schools can be fairly elaborate affairs in fancy buildings with color-coded cars, driving courses, etc. The driving school in today’s photo is walking distance from the Ebisu and Meguro Stations in Tokyo. Something to be aware of if you visit or move to Japan is how to read the train station signs/maps. Based on the above photo (taken from the train platform at the Ebisu Station on the Yamanote Line), you can easily tell that if you are currently at the Ebisu Station and you get on a train going to the right your next station is Shibuya. Most people get that. What you don’t want to skip over is the other information available below. Read the yellow sign before exiting or you can easily take the wrong exit which will put you going in the wrong direction, can cost you 15 minutes or more, and may get you lost altogether. Finally, the sign to left of the yellow one will tell you what car of the train to ride in order to make your connection smoothly or end up at the correct place to easily exit at your destination station. If you have a minute or two to get to the best car before boarding, you may make a connection that you would otherwise miss, again potentially saving yourself much time. You can’t really see the yellow “light” to the right of the main sign so here is a better view. These Yebisu lights line the Ebisu Station. Yebisu is one of the seven lucky gods (七福神). Japan Beer Brewery created the Yebisu label and had a big beer factory near the current Ebisu Station long before the area was known as Ebisu. The area was actually named after the beer. I don’t think much brewing actually gets done is this area of Tokyo anymore, but you can tour Beer Museum Yebisu which is a short walk from the Ebisu Station. 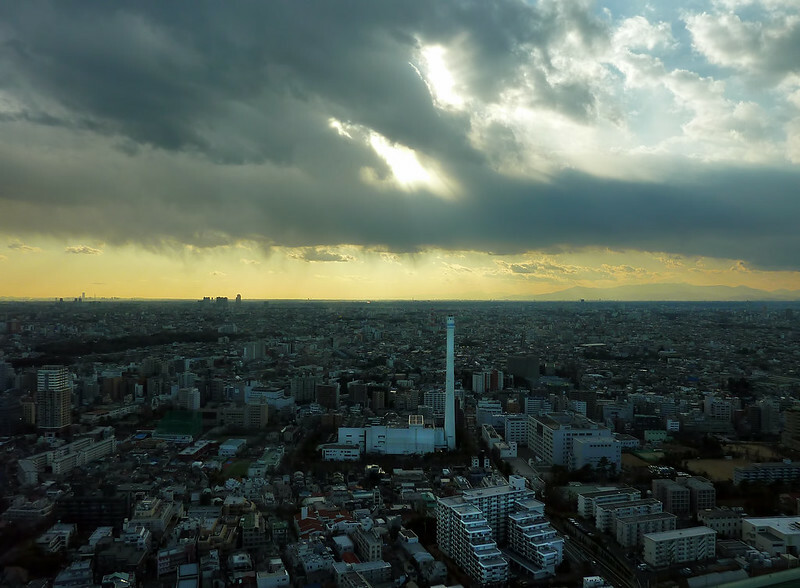 The building in the center may look like a nuclear power plant to the untrained eye, or to someone at Fox News, but it is actually one of Tokyo’s many incinerators. I was able to tour a different one, and the experience has forever changed my world view of garbage. There aren’t any nuclear power plants in Tokyo. And in case the radiation hysteria has entered your mind as well, know that as of this writing Tokyo still has lower radiation levels than most big cities in the world.